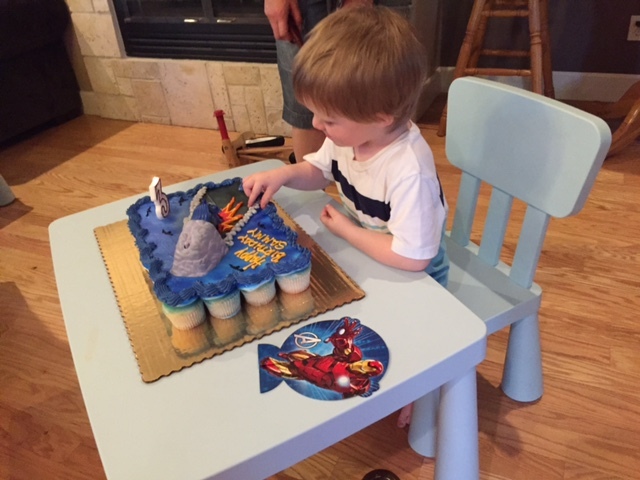 Sammy turned three years old today, October 12, 2015. In some ways it feels like we just brought him home from the hospital a week ago but in other ways it feels like he’s been around for a decade. Raising children (be it biological, step-kids, foster, adopted, or whatever) is NOT for the faint of heart. The last year has brought many changes, as most years do. He’s talking really well, he’s pretty much completely potty trained, he started preschool about a month or so ago, and he’s generally doing a lot of things on his own that used to require our assistance. There’s also a lot in our (mom and dad) lives that has changed. Work has evolved and morphed into new and different things, we’ve worked back into more time without Sammy (between preschool and babysitters), and I think there is a greater level of patience and enjoyment. We had a birthday party for Sammy at our house on Saturday (the 10th) and we greatly appreciate all the people that came to enjoy the afternoon/ evening with us. There would have been more people there but we would have needed a 5,000 square foot house to accommodate everyone. Anyways…we genuinely want to thank everyone that came over and all of those that wished Sammy a Happy Birthday via other forms of communication. To end, I must say that I’m pretty proud/ happy/ in awe of being able to watch Sammy grow up. Three years doesn’t seem like much to me at 38 (39 in November) years old but it really is. To see him go through all the transformations has been surreal, insane, and I guess most importantly, a privilege. Sure some days I wonder when he’ll move out and go do his own thing but when I have the luxury of stepping back like I do right now…it is absolutely amazing. Happy Birthday, Sammy. I (and your mom) love you more than you’ll ever understand (maybe once you have kids) and the one way in which I know that is that we are trying to be better people every single day for ourselves, for each other, and for you. To Sammy-Happy Birthday Mr. It looks like you had lots of fun at your Birthday Party. I really like your Birthday Cup Cake “Cake”. It looked really yummy. Stay cool Mr.
To Matt & Annie- I’m in such awe how you have documented Sammy’s birthday and everything from birth to now. Technology has made it so efficient and easy to keep your thoughts and pictures organized and easily archived and accessible. I would of love to of done this for Mathew. Can’t wait to read about Sammie’s next adventure.